Public engagement activities, history and reports helping guide the development of The City Plan. Join us for The City Plan Story Walks and learn about the innovative ways Edmonton has changed and evolved, and what might be possible in the future. 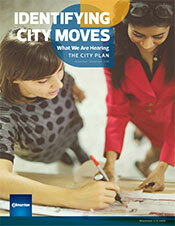 The City Plan’s Big City Moves will give focus to our conversation as we stroll or bike around the city. David Holdsworth, Edmonton’s Senior Heritage Planner, will take us around downtown and share the stories of some of Edmonton’s historic buildings, including those that have passed into history. We’ll talk about how municipal investment, partnership, and advocacy can help to catalyze future development. Learn about the innovative ways the City, local businesses and organizations have reduced their impact on the environment. We’ll talk about how The City Plan will protect local ecology and work to develop Edmonton sustainably as we grow to two million people. As we develop The City Plan and Edmonton’s new Zoning Bylaw we need to take a look at regulation and how it can support development and building reuse. Join us for a stroll around Westmount as we explore examples of building reuse and development and reflect on what future mixed-use zoning could mean in Edmonton. An inclusive and compassionate city must work for all residents, at all hours of the day. Join us for a night walk through the Strathcona area to learn about how Recover, Edmonton’s Urban Wellness Plan, is taking steps to help Edmonton become a more inclusive and compassionate city. Hop on your bike (don’t forget your helmet) and join us for a tour of Edmonton’s bicycle network in the river valley, downtown, and Garneau. We’ll chat about the Bike Plan currently under development, and how The City Plan will work to create more opportunities for active transportation and community connections in Edmonton. The City Plan is a plan for people. How will Edmontonians experience our city as we grow to become a healthy, urban, climate resilient city in a prosperous region? The choices we make along the way will impact how we move around the city, where we work, where we live, and where we go to have fun. 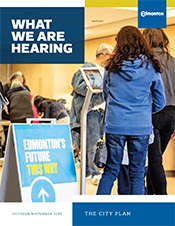 To ensure The City Plan is a plan for Edmontonians, The City Plan includes a dynamic and flexible public engagement program to ensure the voices of our city are heard. Interested in sharing your voice and shaping our city? Check out current engagement opportunities below. Curious about what we’ve been hearing? Read a summary of engagement to date below, or take a deeper dive into our Phase I and Phase II What We Are Hearing reports. What to stay in touch? Prior to The City Plan work, over 4000 individual engagement records were gathered through engagement for Vision 2050. This data was used to provide a foundation for The City Plan’s Guiding Values and City Building Outcomes. Since September 2018, The City Plan team has carried out public engagement events across the city to encourage Edmontonians to refine the Guiding Values and City Building Outcomes. At all those events we asked Edmontonians to tell us what they love about our city, and what the opportunities are as we grow to a city of two million people. Edmontonians commonly describe their vision for our city as a healthy, safe, inclusive, diverse and multicultural with a strong sense of community. Emphasis was placed on being ecologically sustainable, climate resilient, and protecting and celebrating our river valley. It’s important to Edmontonians that our city provide affordable housing and diverse and accessible transportation options. Edmontonians are proud of our engaged citizenry and believe a diverse economy will help to attract global investment. Key stakeholders and members of the public had the opportunity to dream up big, transformational City Moves in a series of model building workshops in late 2018. Represented at different scales, the suggested City Moves generated by the public have been consolidated into the five City Moves. In 2019, The City Plan team will work with the public to create a preferred scenario for our city at two million people, incorporating recommendations on choices and actions into policy decisions to the maximum extent possible. The City Plan has structured a dedicated program to engage Indigenous communities in and around Edmonton. In 2018, we contacted the City’s Memorandum of Understanding (MOU) partners including Enoch Cree Nation, the Confederacy of Treaty Six First Nations, Métis Nation of Alberta Region 4, and the Métis Nation of Alberta. This process is part of the City’s commitment to build and maintain connections with First Nations and Métis communities with historic and cultural connections to the land where Edmonton is now located. Throughout 2019, we will continue participation of MOU partners through dedicated engagement events facilitated by The City Plan Team, and recently retained Indigenous Engagement consultants. As the project progresses, feedback and results from those processes will be reported in a dedicated Indigenous Engagement What We Heard document. In addition to engagement events that are open to the public, we have invited core stakeholders from local public institutions, civil society, and businesses to engage on topics specific to their areas of expertise. Feedback and results from this process will be reported in The City Plan What We Are Hearing reports throughout the project. Public Engagement began for The City Plan in September. Here's what we've heard from you so far. Here's what we heard from you in November and December of 2018.